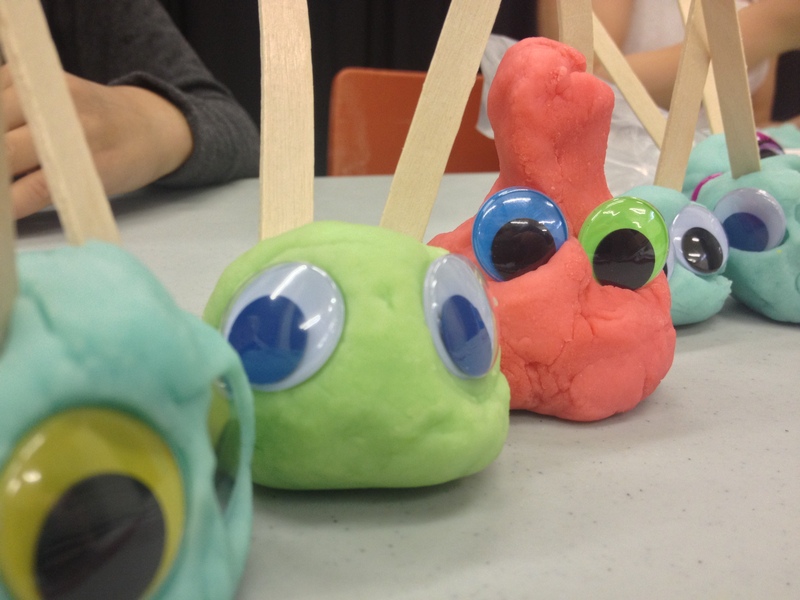 One of the favourite projects the kids worked on this summer was with a simple playdough recipe. From start to finish this project took the kids the entire afternoon and they had great fun getting messy in the kitchen and then creating at the art table. Instead of the standard rollers and cookie cutters we placed craft sticks, buttons, googly eyes, pipe cleaners and just about anything else you could stick into playdough on the tables. After that, the kids made magic! Their new monster creations started to develop a story line all their own and suddenly – we were all being invaded by monsters from another planet. What a great day. 1. Mix flour, salt, Kool-Aid until blended. 2. Add oil to boiling water, mix with spoon until cool enough to knead. 3. Continue kneading until color is blended. 4. Store in air tight bag or container in the refrigerator.